As you read our website and perhaps consider partnering with us, let me share with you how My Father's Home began. I first met Tasha in California when she was hired to be the aide for my terminally ill aunt in 2006. We spent many hours together and as we got to know each other, her story unfolded. Tasha was raised on the island of Bali in Indonesia by her father who is a Christian pastor and her mother who is a teacher. She moved to the island of Java to attend university where she married and had two children. Tasha and her family came to America in 2000. Tash spoke about her father's work on Bali and the special love and concern he had for the children. Many were orphans. Many had parents who would beg her father to take their children so that the children could have a chance to live. It was heart breaking to hear of the conditions of village life. Her father's dream was to begin a home for these children where they could be cared for, educated, and most importantly, loved. 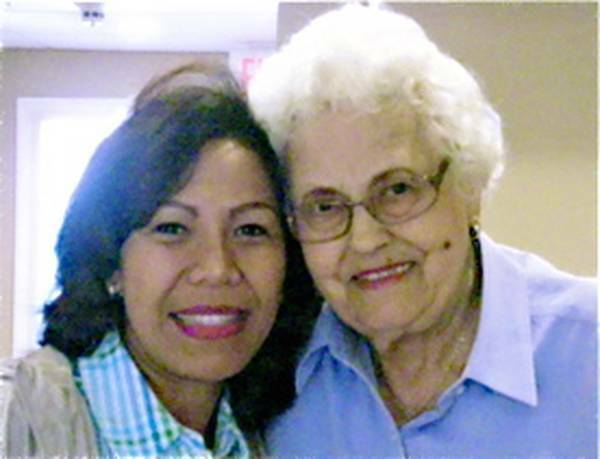 When my aunt passed away in January 2007, Tasha became my elderly mother's aide. One day, Tasha, my mother, Marian and I went out to dinner. In the course of the conversation we talked about Tasha's life story where Marian heard about it for the first time. (Pictured are Tasha and Marian). We talked about her father and his work on Bali and his dream of building a home and taking care of impoverished children. After quietly listening, my 84 year old mother suddenly said, "Let's build it." Surprised at my mother's reaction, I asked "Mom are you sure?" She said, "yes go do it and do it well." Tasha's father cried when Tash reached him with the unexpected news. As Tash and I began the planning, her father began the search for land. With much prayer and rejoicing, he located an acre and a half of beautiful land on a paved road (a miracle in itself). Tasha knew a married couple in Jakarta, Indonesia who were both architects and interior designers. They in turn knew a trustworthy contractor and together across the world our team was formed. Four buildings were designed: a staff house to house missions teams and Tasha's family; a cottage to house overnight guests; the children's home itself designed for eighteen girls and eighteen boys along with counselors and staff; and a covered play area. My mother financed the land and buildings. In the meantime, I met with a lawyer and an accountant to begin a non profit organization called My Father's Home dedicated to both God and Tasha's father who had a dream. Construction began in July of 2007. My husband, Brian and I took two trips to meet with the architects and builder, and to oversee construction which finished in February of 2009. Tasha and her children, in the meantime, moved to Bali where Tash began seeking out the impoverished children who moved into My Father's Home in April of 2009. Since then, my husband and I have been making twice yearly trips to bring over supplies and to minister to the children and staff. My mother, Marian, our founder, passed away in December 2011 at the age of 89 but her legacy of My Father's Home continues on. We hope you enjoy reading about our home on the website and, as you do, we hope you consider being a part of our dream to make a difference in the lives of thirty-six children on a small island across the world.